The DeLonghi DES12 Dehumidifier is a medium capacity unit able to pull up to 12 litres of water from the air every day. It is compact and light-weight making it suitable for flats and other smaller homes. This unit is quieter than most other dehumidifiers in its class at just 38dB. The DeLonghi DES12 has all the features you would expect including a humidistat, auto-defrost and continuous drainage. The DeLonghi DES12 Dehumidifier is very effective for speeding up laundry drying. The DeLonghi DES12 Dehumidifier does have some flaws which have been mentioned in dehumidifier reviews written by users. In the light of user comments I can only recommend this dehumidifier with some reservations. More details can be found at the bottom of this page. With a depth of just 190mm the DES12 is slimmer than most other models and air vents on the sides, rather than front and back, allow it to be placed flush with a wall. Weighing only 9kg the DeLonghi DES12 Dehumidifier is also lighter than most of its rivals and is easy to carry using the fold-down handle or to roll on its castors. With a noise level of just 38dB the DES12 is one of the quietest full size dehumidifiers you can buy in the UK. The DES12 uses 180 watts per hour, equivalent to three 60 watt light bulbs. The humidistat works like a thermostsat, switching the dehumidifier on and off to keep humidity at your chosen level. The DES12 contains a 3 litre water collection bucket to catch the water. If you don't want to have to empty the bucket the unit can also be drained continuously. A hose is supplied and once attached to the dehumidifier it can discharge the water to any nearby drain. Please note that continuous drainage is by gravity feed so the hose must run "downhill" to the drain. An air filter is needed to protect the dehumidifier. The Bio Tech Silver filter adds some anti-bacterial filtration which, while welcome, is of fairly limited benefit. Ice forms on the cold coils of a dehumidifier when the room temperature falls below 18°C. This can damage the appliance so auto-defrost switches it off each time the coils become frosted to let the ice melt. This allows the unit to work without being damaged, even at temperatures as low as 2°C. In cold rooms the unit ices up quite often, making it much less effective. If you need a low temperature dehumidifier take a look at the excellent Mitsubishi MJE16V with "hot gas defrost" or the desiccant DeLonghi DNC65. 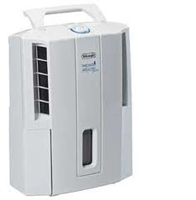 Most dehumidifier reviews of the DES12 are positive. A small number have been very critical. Those who like the DES12 have described it as effective, ideal for laundry drying, straightforward to set up and easy to use. The slim compact design and the convenience of placing the unit flush with a wall have also been praised. Most who have commented on noise say that the DES12 is quiet compared with other dehumidifiers. In negative dehumidifier reviews users have complained that the DES12 is too noisy, the bucket is too small and the power cable too short. Some have been disappointed that there is no read out of ambient temperature and relative humidity. Other complaints made by a few are about "flimsy" components while a larger number found the owner's manual short on information and generally unhelpful. Around one in ten reviewers found that their DES12 did not work properly and returned it within a few days. In my opinion some of the negative comments about this dehumidifier should be given more weight than others. There are complaints about the noise made about every dehumidifier model. By any measure the DeLonghi DES12 Dehumidifier is quieter than most. The same goes for the size of the water bucket. Three litres is quite large in relation to the water removal rate of the DES12 and a larger bucket means a larger dehumidifier! On the other hand a poor owner's manual is cause for concern, and could so easily be corrected. A short power cable is also serious as use of an extension lead with a dehumidifier is not a good idea. Temperature and humidity read-outs could be provided but the dehumidifier would cost more. The buyer must decide for herself on that one. The 10% or so of dehumidifiers which simply did not do the job is worrying. These were obviously faulty when bought but this brings DeLonghi's quality control into question. Of course quality has a price too. The Mitsubishi dehumidifier I referred to above has a record of less than 1% of units developing faults in the first year but it costs nearly twice as much as the DES12. The good qualities of the DES12 are ones that most dehumidifier users value and for those qualities I can recommend this dehumidifier. That recommendation is qualified. The DeLonghi DES12 Dehumidifier does have shortcomings and you, as the buyer, must make the final decision.